We are almost ready to leave Thera, so you may be wondering what happens next. The science team still has a lot of work to do. They must analyze all the data and samples they have collected on this expedition. Much of this work will happen in laboratories, both in Greece and in the United States. The scientists have already started packing up their samples to send home. The scientists are confident that this will not be their last trip to Thera and Kolumbo. 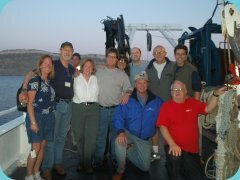 The cooperation between Greek and American scientists will continue in a few weeks on another expedition on a Greek ship. They plan to bring different equipment to help them learn more about the places they have been exploring. This expedition isn't over yet for the ship's crew and ROV team. They will take the ship to the Sea of Crete where another team of scientists will take over. They will be using the ROVs to look at possible underwater archaeological sites. We will continue to stream live video from the expedition here on the Immersion Presents website. For the Immersion Presents production team, it's time to go home. As soon as the last broadcast is over today, we will take apart our equipment and pack our gear. We hope you have enjoyed the broadcasts and website updates.